Official reports from Samsung UK on Twitter confirmed Galaxy E7 will not get Lolipop 5.0 update. I know this will be a very sad news for the galaxy E7 users. For The Galaxy E7 smartphones and Galaxy E5 owners, Samsung has promised an upgrade to Android 5.0 Lollipop later this year. The company had started spreading Lollipop update to other phones/devices in the third quarter of 2015 too, but however,owners of the Galaxy E7 are still looking forward to the update.There has been some unverified rumors that E7 users will not be getting an upgrade. Unfortunately,Based on official reports from Samsung UK on Twitter, it has just been confirmed that the Galaxy E7 will not be getting the latest Android Lollipop update. The company did not explain why it is impossible to develop this version of the OS for the device. It is noteworthy that the Galaxy E5 has been updated to Android 5.0 Lollipop in some regions. The performance characteristics of the device are "THE SAME", so it's unclear what the problem is. 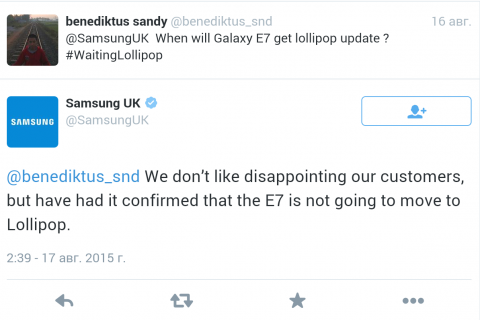 Phonetweakers: Official reports from Samsung UK on Twitter confirmed Galaxy E7 will not get Lolipop 5.0 update.